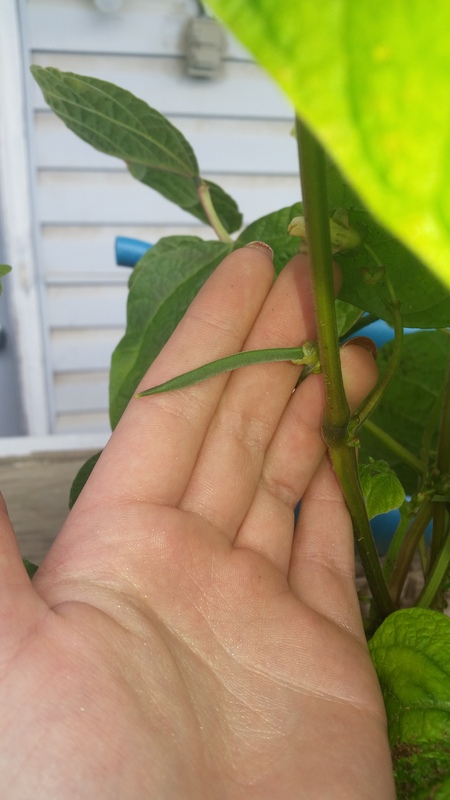 I had a couple surprise this week when I went out on Saturday to check on the plants. I still have to clean up the leaves but the plant is doing good. 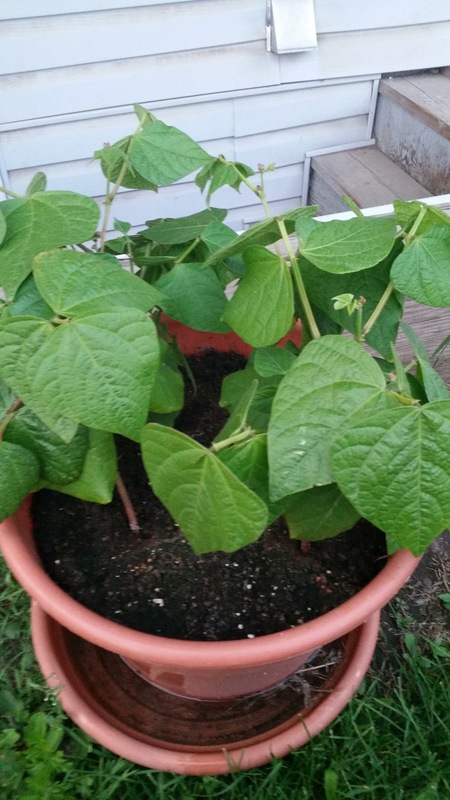 Next year I will only be doing two per pot though. I think they need that extra root room. 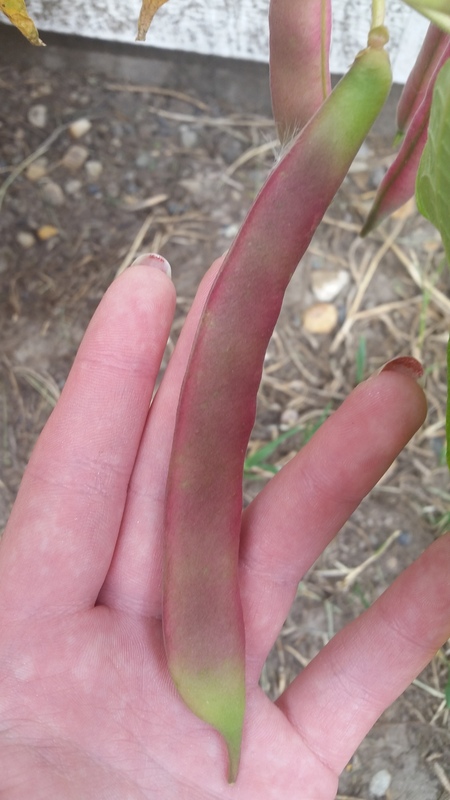 They are starting to mature and very much turning pink! It is a pretty cool process to see. I will be double checking to see how to tell when these guys are mature for picking. I think a few of the will be ready by next weekend. 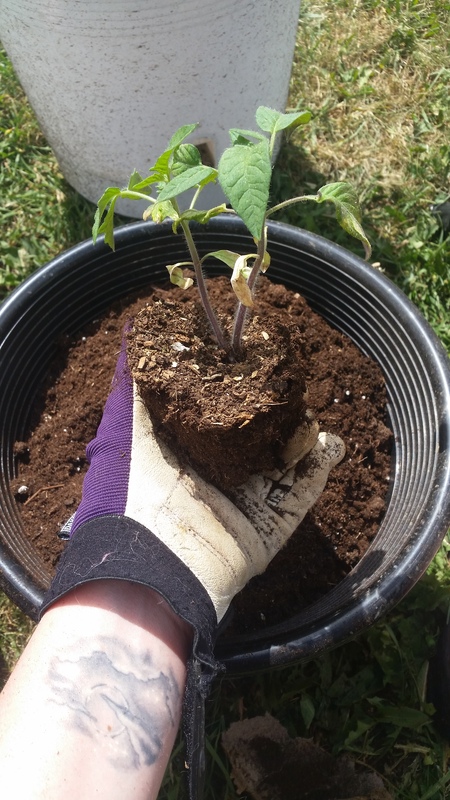 Now I had mentioned that I had two tomato plants that may or may not make it. They also needed to be separated from the pot they were sharing. To my surprise not only did both of them come alive but there was a surprise third tomato that also came back to life. I have one Black Yum Yum and two Juane De St Vincent. So many mistakes that I need to correct for next year. These are the Juane De St Vincent tomatoes. Separating them was quite the experience. I think they will make it though as I checked on them not to long ago and the looked very well. 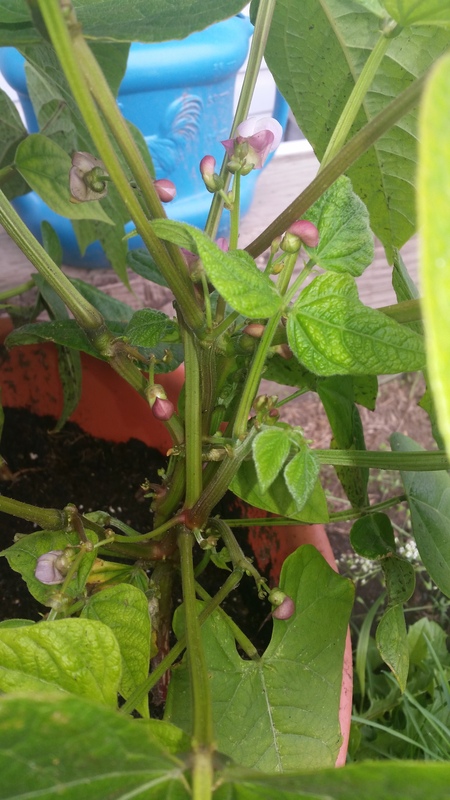 In the white pot is the Black Yum Yum, I decided against name plate stakes since I only have a few plants. These pots are borrowed from my Mother as well. They are self watering. Now the plants will end up coming into the house since I had a lack of time perception. No matter what I am still happy with how things are going and only slightly disappointed on the amount of mistakes I have made, Also all the poor plants I have lost. For the first time in over a decade I went camping. While it was only for a couple of nights I was ecstatic. I could take the dogs (see if it could become a regular thing) and I got to see family. Getting things ready was a bit hectic only because it was very little notice and my car was going in for brakes the same Friday that I was suppose to leave. Driving out to the ground (2.5 hours) I was so very excited. I had not seen the kids or my sister since Dittany’s birthday which was the beginning of December and I had yet to meet my newest niece (no special name for her yet). Friday went over well. Dittany was excited to see me and Acacia…well he is never too excited for much for very long. It did not take Galaxy long to sniff the kids out and leave them be. However she was protective the entire weekend. I cannot say that to much happened. Friday night/Saturday morning was a different story though. J got up and when he came back into the camper he did not close the door all the way (or it did not latch but the next part is not to surprising). I woke up to mosquitos eating me alive and it took a minute or two but I realized the door was open. It took a few more seconds to realize that Galaxy was no longer in the camper. I think she pushed the door open but she was gone. I left her training collar turned on more so for the barking. I am glad I did that as I had gone outside and did not want to wake the whole camp ground up screaming her name. Then have people freak out. All I had to do was vibrate her collar a couple of times (it is good for up 3/4 mile or 1.2 km approximately) and she came barreling down the road. The rest of Saturday was pretty good as far as the dogs were concerned. I cuddled with baby plenty. Not a the entire time as there was lots of visiting to do in such a short amount of time. I did get to introduce her Galaxy (maybe that happened Friday night) and Galaxy was very gentle. She only ever toughed her lightly with her nose, did not lick her at all. I was impressed to say the least. I taught Dittany the night before what Galaxy’s hand commands were. 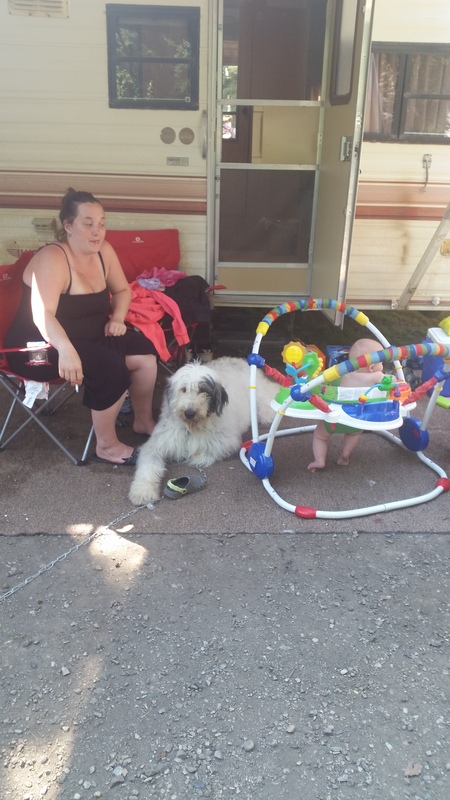 Dittany was able to tell Galaxy to sit and lie down with out anyone else around (we were in the camper and I was spying ha-ha). I did get one picture and I love this picture. As long as Galaxy was in the middle and could protect every one she was fairly happy. Plus she just likes being around the kids. I realize I have not really mentioned Bullet. He is pretty much set in his ways. He wants to be around everyone but having to be on a lead makes that difficult for him. Every two minutes you are untangling him. He was never left alone and Dittany walked him which means he did get some run time in. I did have to put him in the camper twice though. He would have a barking fit and controlling two dogs of two very different sizes was not easy. We took a walk, we also went down to the river. Galaxy did get a very little bit of off leash time since we were away from everyone. She wanted to wade in the river and I was not about to join her ha-ha. That evening I drank more than I normally would (but that is what you do when you are camping). The dogs and I slept in the tent so there would be no one missing in the morning again. Maybe next time Dittany will actually join me in there. Sunday was uneventful. Freddy did most of the packing and to be fair I did kind of avoid it. I held out in the tent for as long as I possibly could. I had been up much earlier that morning before any one else was up and grabbed my pills from the camper. My shoulder was in very bad shape between sleeping in the camper and then having slept in the tent. When I got back the door was open (Galaxy was on her lead so no worries about strangers entering it) but I also let mosquitos in. After all the trouble we gave J on Saturday. I think they need to invest in a bungee cord or something. Slamming the door and potentially waking up kids was not something I was about to do. All in all it was a fantastic weekend and I would love to be able to do it again. Being able to see almost everyone was amazing and I rekindle my love for camping. If not this year I want to do it again next year and be much more prepared. Like having a cot to sleep on instead of a foamy on top of the dog bed from the car. I also wanted more pictures but I do not focus on those things when I do actually get time with the kids. I gave them disposables and should be able to pull a few pictures for the album from those. I missed last week again but for a good reason this time. I went camping! I did not really take any pictures except one. I will do a post on that later this week. In the mean time I was trying to catch up on things I would have normally done on the weekend during the week. I just over-whelmed myself. How ever that situation is slowly improving itself. This week all I have for pictures are the beans. 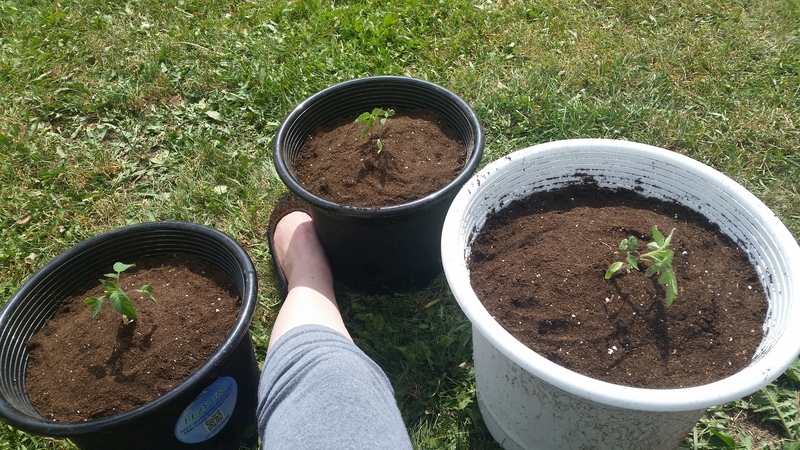 I have a couple tomato plants still alive (I put the plants outside to early. Oops! )….I think they are still alive anyways. The end of this week I will let you know how that exactly went over. They look good. 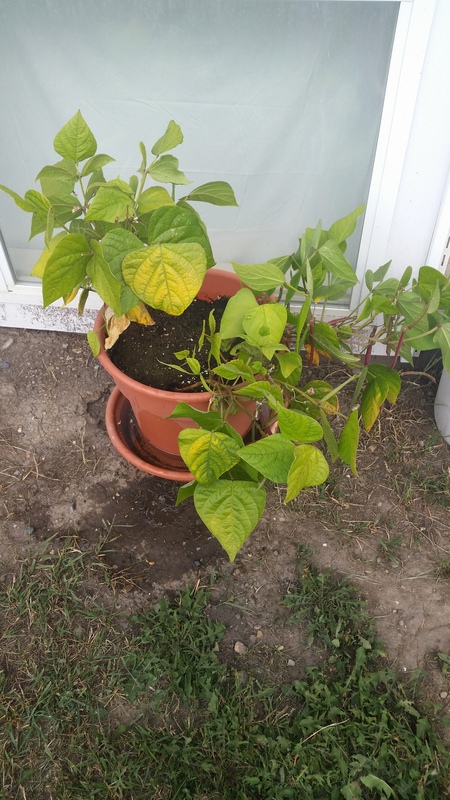 A few leaves yellowed but that is because I did forget to water them before I left for a weekend. I also have since lost the smallest plant. It was not anchored into the soil very well and I could not help it out. 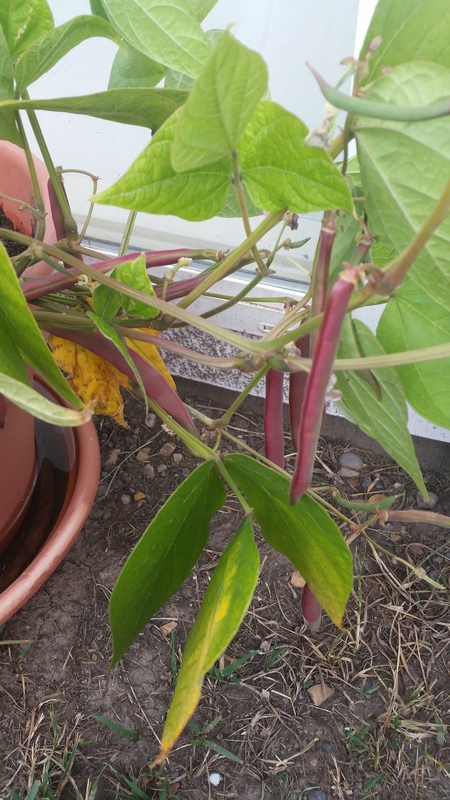 Lots of flowers still happening but we do have beans! They are not pink yet but they are also no where near being mature either. These plants have completely surpassed my expectations and seem pretty hardy since they are still alive. There really isn’t much to update at this point. Things are moving slowly and the tomatoes are definitely going to end up in the house. I’ll show you some pictures. 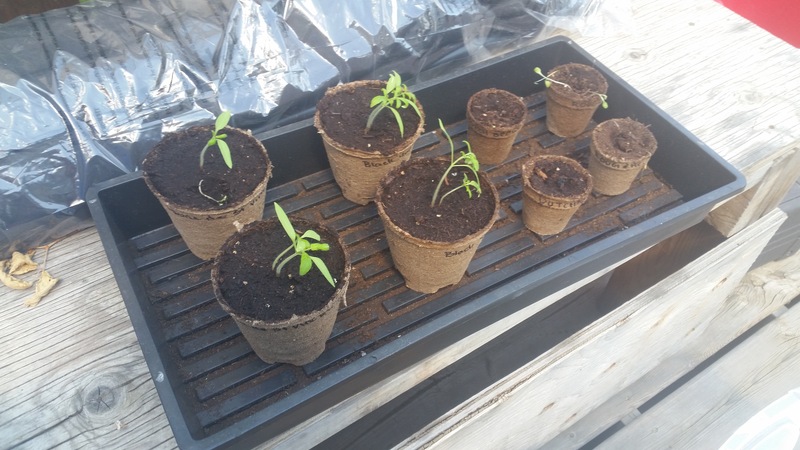 I am hardening them off for a couple days and then I will separate the tomatoe plants. Next week they will be in thier big pots. 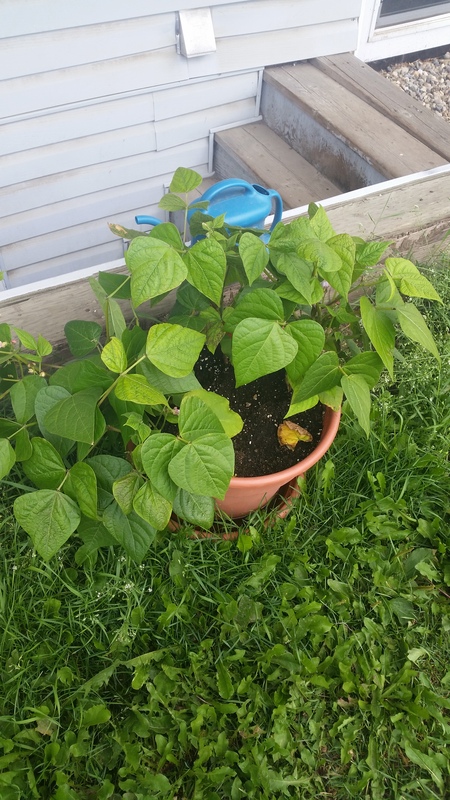 The beans are doing great. They aren’t very far behind my moms. The were planted a couple weeks apart as well. I would love to post more on this but it’s just been a long week and the weekend has been even longer. This coming week will be much better though. Fingers crossed! Starting at the first bullet point; cutting my debt by 1/3. Halfway through the year I should be halfway to this goal right? Unfortunately that is incorrect. I just tried checking my most important debt and unfortunately the site is going through maintenance. So with a quick estimate of what the debt was owing at the beginning of the year I am actually 1/3 of my way to my goal. Funny how that works out. As long as nothing happens this goal will be completed. Talking about paying off debts. I have no current subscription boxes, the dogs food budget is as small as it can possibly get, and pretty much all of the extras have been cut out. I get take out twice a month on payday ( I am paid semi-monthly which I love), every couple months I may grab pop or dessert from the store, and I buy wine only a couple times a year. Now I have kept Netflix, Shomi, and my credit protection subscriptions. That is pretty much my ‘play’ money as other would call it. I am also getting my hair done this week but for me that is a reward. I cannot say how excited I am to for the day I have no more debt payments to make! The second bullet point did happen and things didn’t work out this time. The future is unknowing though. I am not going to get in to anymore of that (mostly because it is someone else’s business as well). Bullet point three is continue research into adoption. I am still doing this and I am also a member of Adoption Council of Canada. There is not much more to elaborate on this subject yet. Brining my blog follow back up. This does not really have a set number or anything. So it is kind of hard to say where I am. I am somewhat posting regular again. That seems to be helping. I think I am getting there but I’ll be able to look at it in more detail at the end of the year. A life of stability; this I feel is happening. I have money plans laid out and the cleaning schedule is becoming routine again. While there are still some unknowns I feel like I can take those on with out experiencing anxiety or pushing myself into a depression. As long as the car does not break down and no one has a medical emergency. Last but not least is entering the next step of my career. I have done this and a little more. Having my own clients is no longer in the picture as I have become much more involved at the office. I am going to continue that way instead. To me everything looks like it is going well. I do not want to say this is all because of me since it is not. I have had help from others in different ways. Some directly and some indirectly. I am just really happy with the way things are heading. I guess in six months we will look and see if everything continues going forward. I might take another look at how the debt progress is going in October since it probably is better to check on that more than twice a year. Don’t forget to like us in Facebook at Chocolate Milk Cows!